At the weekend we are all for easy outfit ideas, as on a Sunday morning you want to spend as much time as possible either snoozing or actually out and about doing things. There is one throw-on outfit that we keep spotting on our Instagram feeds this month— leather shirts worn open with a white T-shirt and vintage-style straight leg jeans. In 2018, many of us started dressing like Texan natives in cowboy boots and double denim, and the Western trend is continuing well into 2019 with leather shirts. Designers including Isabel Marant, Victoria Beckham and Ganni have been bringing leather shirt back. 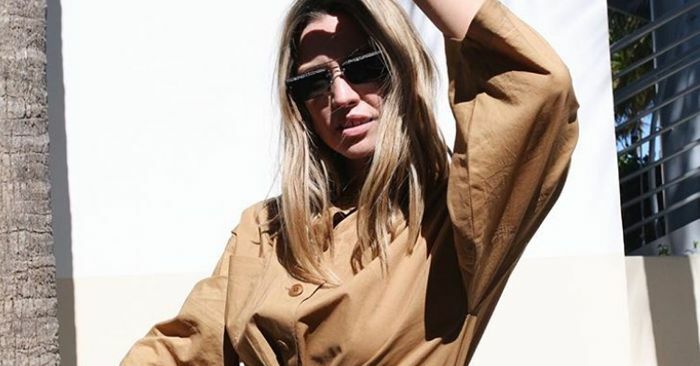 Budapest-based brand Nanushka is creating amazing leather shirts in brown, caramel and black vegan leather, which means it is actually machine washable. There are also a number of popular leather shirts on the high street this season, including Arket’s classic leather shirt and Topshop’s more oversized style which is available in both white and black. The easiest way to wear them is paired with straight-leg blue jeans, a white T-shirt and black loafers or ankle boots. Keep scrolling to see this foolproof weekend outfit, and then shop our edit of the best leather shirts around.